The 1540 church in Koziebrody may have looked similar to the church in Zawidz (pictured above) as the written description is very similar and they were built 8 miles apart in the same architectural period. A Detail from the "Mapa topograficzna Królestwa Kongresowego z roku 1839"
This map shows the church and bellfry (No.1) built in 1540. It appears to be facing the main street as it is drawn oriented N-S on the long axis, opposite from the current 1880 structure. A cross with a statue on it (No.2) is shown on front of the church, just to the left. The bell tower, separate from the church, according to the 1817 "vicarial visit" description, would be consistent with the arrangement at the church in Zawidz (pictured above). 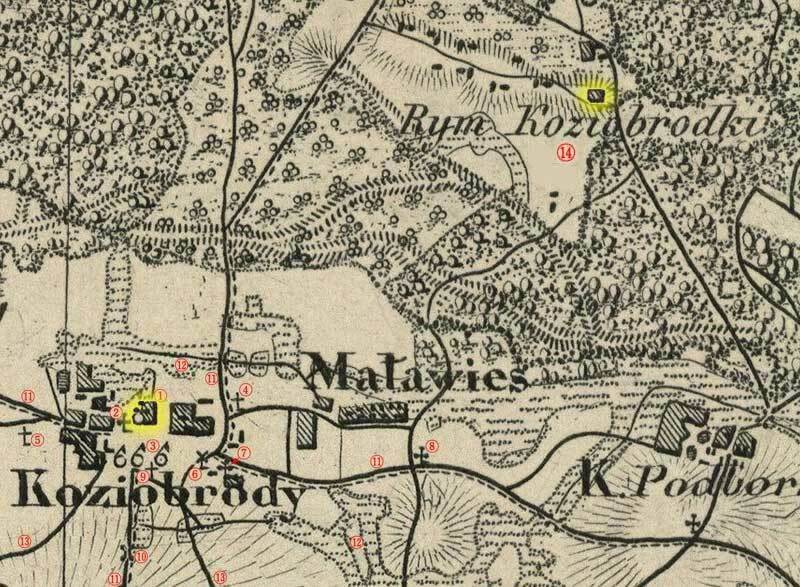 Note the "Rym Koziebrodki" notation on a 1836 map of Koziebrody. "Rym" is an abbreviation of "rymarstwo," a "saddlery" in English. This would make sense as the Koziebrodzki Family (the owners of Koziebrody) was know to have very fancy equestrian structures at their hunting lodge estate which burned down in 1963. "At the place where there was a wooden house on the (latter) Thun property (which burned down in August 1963), stood a palace, to which many guests were coming for diversion and hunting." Also note the tree lined path leading from the lodge to the village.